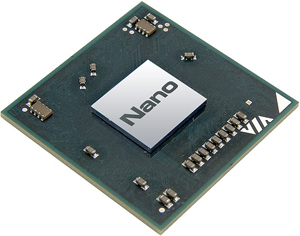 Previously we mentioned about VIA Nano processor that supposed to compete against Intel Atom processor in nettop and netbook market, but seems that the powerful tiny processor not only able to enter into these competitive market space, but it is claimed to also getting new design win in other segments even from server application. The most recent success story in this segment is the Taiwanese fab-less chip vendor has managed to engage and integrate Nano solution into Dell Computer’s server products, making it one of the potential opportunities that the thermally efficient chip can grow beyond typical end users based nettop or netbook markets. One of its products, Dell XS11-VX8 is expected to be running with twelve CPU core in a single 3.5-inch rackmount design. Although some may question about its performance as compared to other solutions from Intel or AMD, but the obvious advantage will be around its low power consumption as well as few times lower cost which are especially suitable in current economy situation and eco-friendly environment initiative. According to reliable source, a full dozen of Nano processors clocking at 1.3GHz probably consumes less than 30 Watt and more importantly, the system BOM (Bill of Material) cost is cheap enough while the users will still able to benefit from its advanced 64-bit architecture as well as virtualization technology capabilities. No information on when it will be available yet, the total system is expected to cost less $300 which is ideal for hyper-scale environments such as low power and light server applications where cost and power consumption are at concerns.